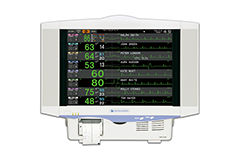 You can make a wireless monitoring system with transmitters and a Nihon Kohden central monitor with multiple patient receiver or a Nihon Kohden telemetry system. By continuous measurement of important vital parameters, patient condition is always monitored so changes can be quickly handled. No cable between the patient and monitor, so the patient is free from the bed. The transmitter is compact and light-weight, so it is easy to wear. Instead of visit and manual measurement, automatic measurement saves the care staff’s time. No complicated preparation to start measurement. The CALL key activates the recorder* and nurse call at the receiving monitor (ZS-611/620/630/530PG). The long battery life reduces running costs.